Earlier this month I attended a masterclass at ACP with Binh Danh on the subject of ‘picturing memory‘. For a total of 9 hours over two Saturdays, myself and seven other keen photographers (including Rebecca and Kathryn) worked through activities and discussions at the ACP library in Paddington. As well as being drawn to Binh’s chlorophyll print technique, memory and trace is a dominant theme for me. There is much of the used-but-forgotten, travelled-but-empty that I find powerful, both in mood and content. So I was keen to see if I could gain some insight into Binh’s artistic process. The agenda for the course was straightforward. On the first Saturday, after introductions Binh went through a number of the themes in his work. Then we tried out making our own chlorophyll prints, and Binh shared some of his techniques. The next week we checked in on our prints and discussed our work in the context of what we’d learnt. Binh also presented the work of other artists with similar techniques, such as Katherine Adams‘ emulsion / polaroid transfers, Deborah Luster‘s tintypes of prison inmates, and Larry Sultan, investigating the “aroma of daily life” with his own parents. Binh is exhibiting in the current Biennale of Sydney (BOS18), with works from his series ‘Searching for the Cosmos’ and Immortality, The Remnants of the Vietnam and American War. These chlorophyll and resin prints also feature in earlier series such as Ancestral Altars, In the Eclipse of Angkor and Military Foliage. 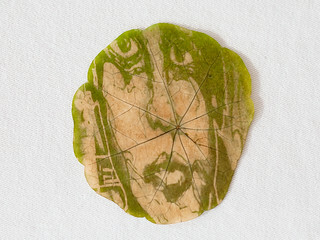 Binh typically works with found images, and the series I found most compelling is One Week’s Dead, where he revisits a 1969 Life magazine article called ‘Faces of the American Dead: One Week’s Dead‘, reproducing the faces of the casualties onto local Vietnamese foliage. There are a lot of themes in this series that are really evocative: witnessing, war, death, memories, landscape, loss, the cyclical nature of matter (‘elemental transmigration’), found objects and the nature of photography. Binh’s been working alot recently with dageurrotypes, looking at Walt Whitman’s ‘Songs of Myself’. He’d used them before in In the Eclipse of Angkor. They offer a very different photographic experience; they feel more personal, a ‘mirror with a memory’, almost as if the image they contain is more than the kind of image we are used to – a ghost. This is in keeping with his overall artistic process, which is to investigate and rework personal memories, which he began with his grandparents’ stories of fleeing Vietnam, and has worked through in contemporary Vietnam and United States. It was a shame Binh wasn’t in Australia longer; I think he might have been very interested in the fraught political situation refugees find themselves in here. This masterclass was one of the first coproductions between ACP and the Biennale. I would rate it quite a success. Binh was gracious and knowledgable, and I gained no small benefit and enjoyment from the interaction of all the participants over the course of the two days. …and of course, if you haven’t seen the work of Binh Danh and the other marvellous artists at this year’s Biennale, do. Highly recommended.